Domestication of pigs began in the 1980s, in the United States and Canada. Potbellied pigs are not a specific breed of pig, but rather, a regional type of pig. Coming from south east Asia and primarily Vietnam, potbellied pigs belong to several different breeds. 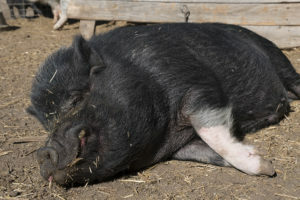 The most predominant breed is called í, the shortest name for a breed in the world, and are generally referred to as Vietnamese Potbellied Pig. In the wild, these potbellied pigs reach an average of 200lbs, and feature bristles along the neck (aka a mohawk), dipped back, and a low-hanging, predominant belly. These potbellies are typically black in color, and often have wrinkly, “squishy” faces. A second breed from Vietnam is called Co, and is a dwarf pig with a characteristic sway back and potbelly. Co pigs reach an average of 90lbs at maturity, or three years of age, and were raised free-range in the high plateau regions and mountains of Vietnam*. Potbellied pigs were not new to North America in the 1980s; they had been prevalent in medical research industries as early as the 1960s, but exportation grew in the 1980s to add these cute creatures to zoological collections, and later, as family pets. Three distinct lines, all originating from southeast Asia, were brought in: the Con line, Lea line, and Royal line. 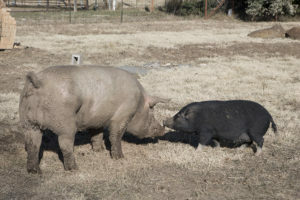 These pigs were a combination of breeds, ranging in sizes from 100-300lbs, and primarily black and white color combinations. Current domesticated pigs in the United States have been cross-bred over the years with other pig breeds outside of the Asian region, including Göttingen Mini Pigs (bred in Germany for biomedical research); Kune Kune pigs from New Zealand; and larger, commercialized breeds such as German Landrace and Duroc pigs. The expected weight of what we call mini pigs (in the United States) is a low-end of 70lbs, and a high-end of 250lbs. There are always anomalies, however, with pigs weighing slightly less or slightly more than the normal range. Just like with humans, a pig’s genetics determines size and weight, and knowing a pig’s lineage does not guarantee a specific size. Mini pigs are classified as such because of their size range; their cousins on the farm, such as Hampshire, Duroc, and Yorkshire breeds reach an adult weight of 600-1200lbs. In comparison, the domesticated breeds are most definitely miniature. There are many unethical issues prevalent in today’s breeding of domesticated pigs, leading to what we call the plight of the mini pig. Unlike other domesticated animals–such as dogs and cats–there are no breeding regulations or standards for pet pigs. 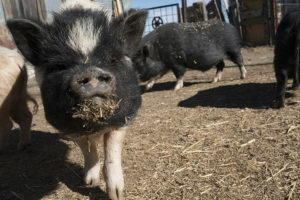 Across the United States, a plethora of backyard breeders exist, breeding piglets and doling out poor information to unsuspecting new pig parents. Let’s start with a discussion about terms used to sell piglets. Teacup pig, micro-mini and other names have been coined in the breeding industry to sell more piglets. 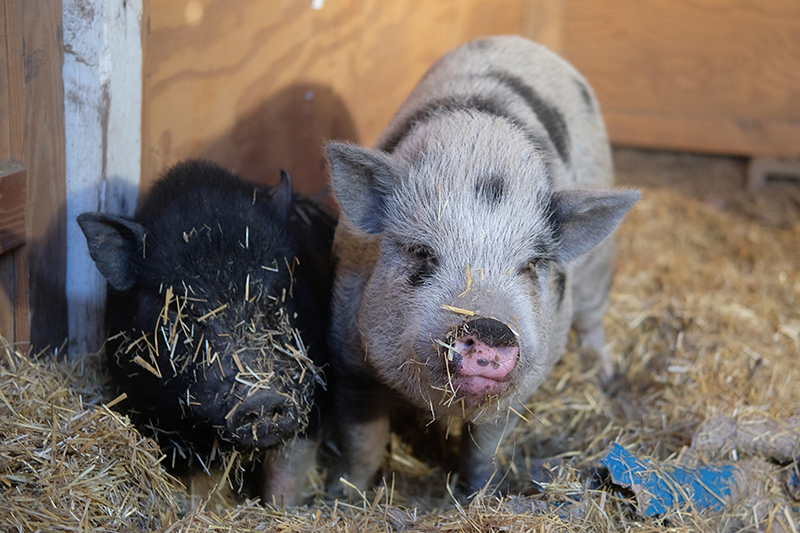 These are deceptive descriptions in reference to pet pigs–while the domesticated pigs are all mini, there is no such breed that remains smaller than 50lbs at maturity–and most do not even stay under 75lbs at maturity. Many breeders start breeding their pigs at young ages, and potential new pig parents may see small parents that have not reached adulthood. Pigs grow until they are a minimum of three years old, though by the time they are two, height and length is pretty well established, and they fill out over the next few years. Full maturity happens between three to five years of age. While there are ‘ethical’ breeders around, they are sorely outnumbered by those only in the business for profits. Unethical breeders often separate piglets from their mothers at too young of an age and sell “bottle babies,” piglets that aren’t weaned and are typically younger than six weeks. Bottle babies do not learn important skills from their mothers, and tend to be higher maintenance through youth with dependency issues, separation anxiety, and may have behavioral issues. Many breeders also suggest that their piglets are truly micro, and will not reach more than 30lbs at maturity. Others offer poor nutritional advice, suggesting that pigs be underfed to stay small. Malnourished pigs have a lower life expectancy; their organs will grow to full size, while their skeleton does not, causing a slough of health problems as they mature. Life expectancy is significantly decreased–malnourished pigs tend to only live a few years, whereas a healthy pig can live a full life to 20+ years. 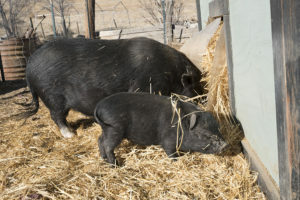 There are also problems with inbreeding, with a goal of smaller pigs–but again, health problems arise that decrease life expectancy in these pigs. If you’re still reading, you should by now realize there are some serious problems surrounding the breeding and lack of regulations in the mini pig world. Only 2-5% of pet pigs remain in one home during the course of their lifetime, a problem that we attribute to unethical breeding practices, poor information/lack of education, and the pure novelty of owning a pet pig. 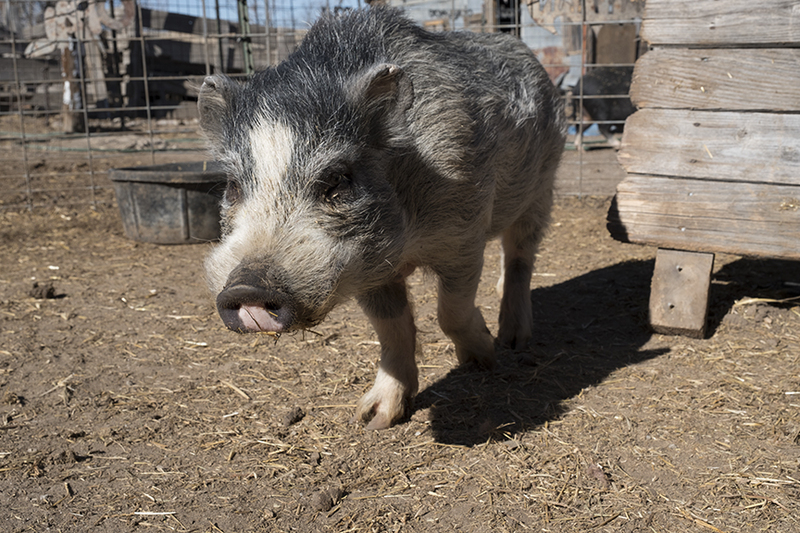 As a pig rescue, we hear no shortage of excuses for those surrendering their ‘beloved’ pets. 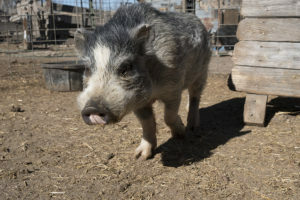 As of 2017, Hog Haven Farm receives a minimum of four phone calls per week regarding surrender, and there is never a shortage of pigs in need of homes on online groups and forums, too. Mini pigs needing new homes is becoming an epidemic; there is a shortage of rescues able to handle pigs, and those rescues that do are overflowing with unwanted pet pigs. #1: size. Many people jump blindly into the world of pet pigs, and buy into the myth of teacup pigs. Additionally, many new pig parents do not understand the definition of mini, and do not realize that even a 250lb pig is mini compared to many other breeds. Many pet pigs are abandoned by the time they are 1-2 years old solely due to size. #2: behavior. Pigs are social, intelligent, and naturally curious creatures. They require a different form of training than dogs do, and not understanding their behavior is a leading cause of surrender. Pigs are dominant, and will constantly push boundaries to exert dominance. They are also routine oriented, and parents who cannot have a regular routine are not ideal candidates for keeping a pig. Understanding how to be alpha with a pig is crucial to a successful human-pig relationship; many pig parents become frustrated and give up instead of learning how to balance a relationship with their pig. #3: dogs. Pigs, by instinct, are prey animals; dogs are predators. Introducing pigs and dogs can go seemingly smoothly, especially when the pig is young. However, they are not symbiotic animals and will not form strong, lasting bonds to each other. Pigs cannot defend themselves against a dog attack, and the results are often tragic from a dog-pig fight. #4: zoning. Pigs are still not a widely accepted domesticated pet, and in some jurisdictions are classified as livestock. In Colorado, there are several cities and counties that have bans on pigs; others have size restrictions. HOA’s are also a contributing factor to pigs being surrendered; while they may be legal in the county, the HOA has an enforcement against them. Hog Haven Farm firmly believes in educating current and future pig parents, as well as the general public, about pet pigs. They are wonderful and rewarding; pigs are quirky, full of personality, and are extremely affectionate. With proper training techniques, and an understanding of their behaviors and needs, pigs make wonderful companion animals. Our main goals for education include training/behavior modification; nutritional information; socialization with strangers; and busting the size myth surrounding mini pigs. We encourage and welcome visits to our rescue and sanctuary, where visitors can meet pigs of all shapes, sizes and breeds. We specialize in mini pigs, but have four large “commercial” breeds as well (650lb Lucky, an adult Yorkshire; 300lb Journey, a young Hampshire; ~300lb Dug, a young Hampshire mix; and 65lb Mac, a 5mo old Yorkshire mix). 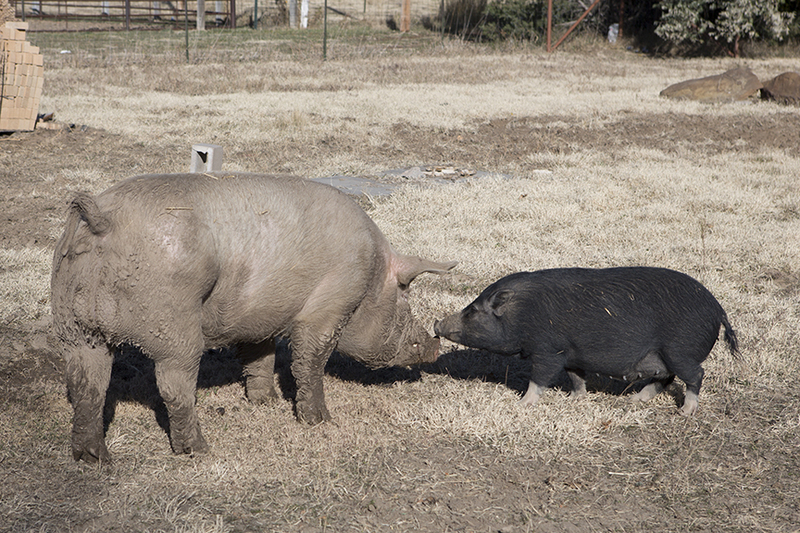 At any given time, Hog Haven Farm has younger pigs (less than 6mo old) that are a great comparison against full grown pigs and our commercial breeds. Seeing these pigs firsthand is step number one in becoming properly educated on mini pigs. Step number two is to fight for breeding regulation, and to eliminate backyard and unethical breeders. This will come about as a result of educational programming, as will amending zoning restrictions that force owners to surrender their pigs. *Information adapted from Porter, V. (1993). 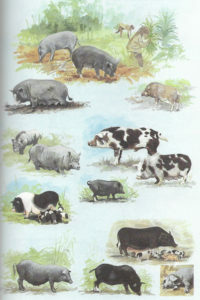 Pigs: a handbook to the breeds of the world. Ithaca, NY: Cornell University Press.